The asking price you set for your home significantly affects whether you will profit in the sale, how much you will profit and how long your home will sit on the market. 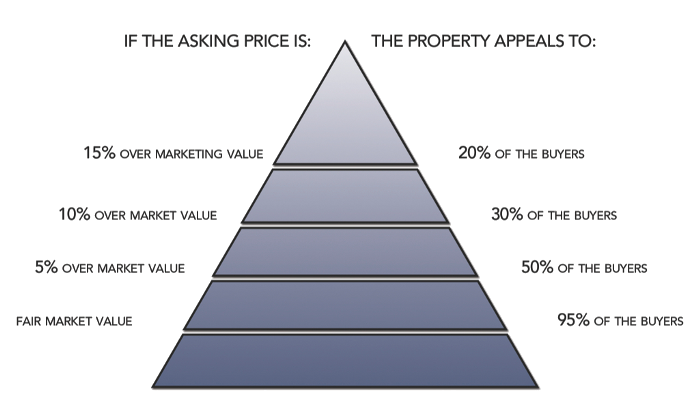 The knowledge we have of the overall market and what’s selling – or not selling – is invaluable in helping you determine the price. The objective is to find a price that the market will bear but won’t leave money on the table. Here are some points to consider: Time. Time is not on your side when it comes to real estate. Although many factors influence the outcome, perhaps time is the biggest determinant in whether or not you see a profit and how much you profit. Studies show that the longer a house stays on the market, the less likely it is to sell for the original asking price. Therefore, if your goal is to make money, think about a price that will encourage buyer activity (We call this fair market value).